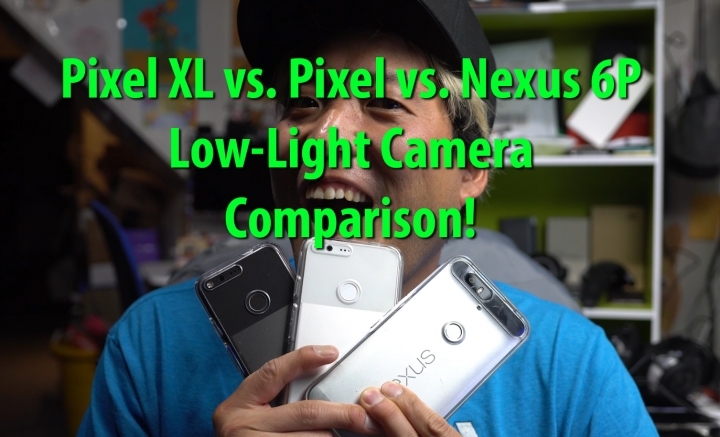 Pixel XL vs Pixel vs Nexus 6P Camera Low Light Comparison! In this camera low light comparison, I compare the Pixel XL vs. Pixel vs. Nexus 6P. Since some of you suggested Pixel performs best on HDR On, this is the sequel to my first camera comparison. All phones were set to HDR On. And I’ve even included a regular Pixel (which has the same camera s Pixel XL) just to make sure that I don’t have a bad unit. Pretty fascinating (again). While the Pixel XL and Pixel didn’t over-expose the lights like the first time around, it didn’t actually take better photos than the Nexus 6P. In fact, most of the results from all Pixel XL, regular Pixel, and Nexus 6P were nearly identical and indistinguishable unless zoomed in at 10X or more. Overall, I am satisfied that the Pixel XL and Pixel gave the same results as the Nexus 6P in HDR On mode. While Pixel phones didn’t improve upon Nexus 6P much, I am satisfied knowing that it is still king of low light. I have seen your video in youtube. I am wondering if you could compare nexus 6p with tweak camera nx v5.4 (which developed and suggested by member of xda forum as it’s give same zero lag and special hdr processing on pixel) vs the real google pixel. Next story Pixel XL vs Pixel vs Nexus 6P vs S7 Edge Screen-On-Time Battery Test! Previous story Pixel XL vs S7 Edge vs Nexus 6P 4K Camera Video Stabilization Comparison!